In September, the Destinations Book and Dinner Club of which I am a part is scheduled to discuss Pete McCarthy’s memoir McCarthy’s Bar: A Journey of Discovery in the West of Ireland while enjoying a meal at a local Irish pub. As I am going on a week-long “field trip” to Ireland next March with this same book group, I am a bit bummed to miss this book dinner, but I’ll be in Mexico then. However, as I am anxious for our Ireland trip too, I still read the book. This was a great, light-hearted read for me, as I’ve recently finished books on the Rwanda genocide and life in the Mumbai slums, and I’ll soon begin my grandiose summer reading challenge. It was about time I lighten up a bit. 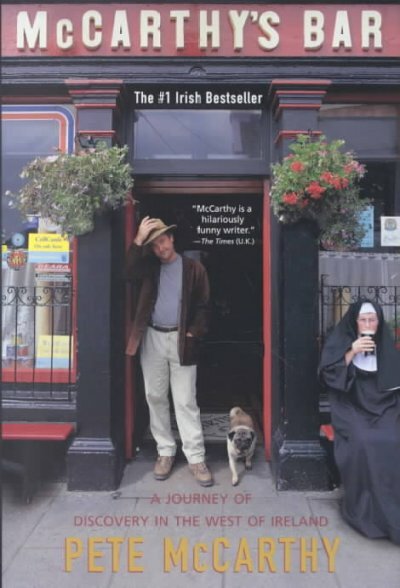 McCarthy’s Bar is the story of a middle-aged Englishman with half-Irish ancestry, and his travels through Ireland while searching for a sense of place. A humorous writer, McCarthy has a host of travel rules such as: “Never Pass a Bar That Has Your Name On It”; “Never Eat in a Restaurant with Laminated Menus”; and “Never Try and Score Dope From Hassidic Jews While Under the Impression They’re Rastafarians” (page 3). In this memoir, McCarthy travels to off-the-beaten path places such as the birthplace of Michael Collins and ancient Celtic stone rings surrounded by electric fences, and he even goes on a pilgrimage to St. Patrick’s Purgatory. Singapore Noodles plays a prominent role in the book, as McCarthy states early on “the best gauge as to whether or not a country is expensive is the price of food in its Chinese restaurant. A complex calculation based on the cost of a plate of Singapore noodles will tell you the current rate of economic growth” (page 14). 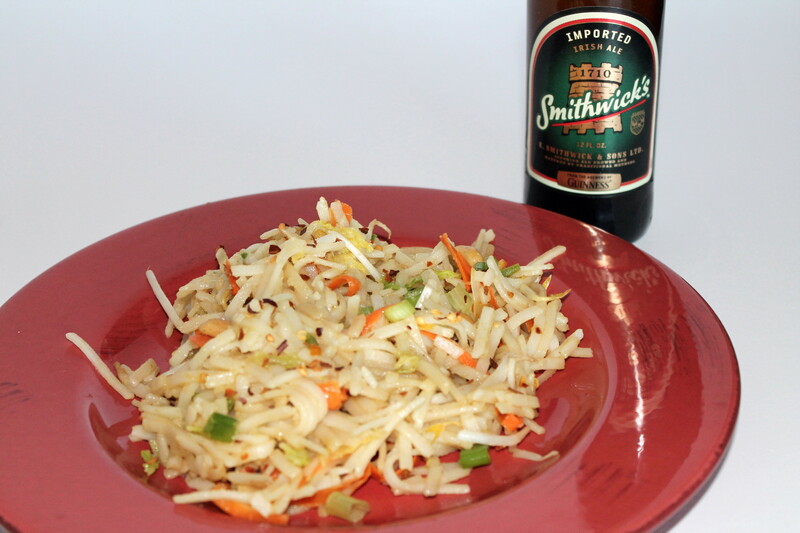 Singapore Noodles make random appearances throughout the remainder of the book, including as McCarthy’s final meal before the above-mentioned pilgrimage. This recipe will always hold a special place in my heart because: (1) It is the first recipe shot with my brand new camera, which arrived yesterday; and (2) It is possibly the first complex recipe I’ve developed based on concept alone (and the recollection of feasting on Singapore Noodles in Christmas’ past). Yes, I am a giant nerd and get much of the inspiration for my recipes from Wikipedia. To begin, you’ll need to par-bake the vermicelli noodles. Bring a large saucepan of water to a boil. Remove from heat and set aside. Add dried noodles to saucepan and soak for 10 minutes. Drain. 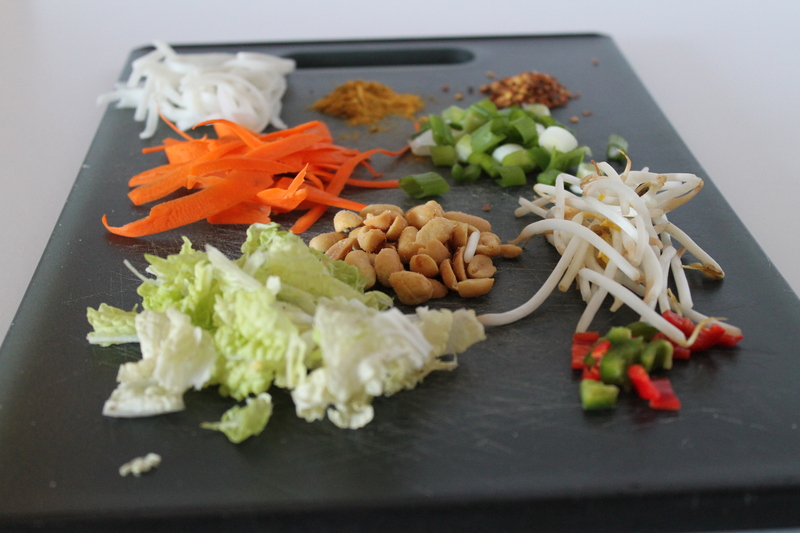 While preparing the noodles, you can do all of the prep work for the vegetables. The key to a good stir-fry dish (as I learned in a recent cooking class) is to know which order to add the ingredients and how long to cook each. To organize things, I like to place each set of ingredients in a row according to the order they should be added. 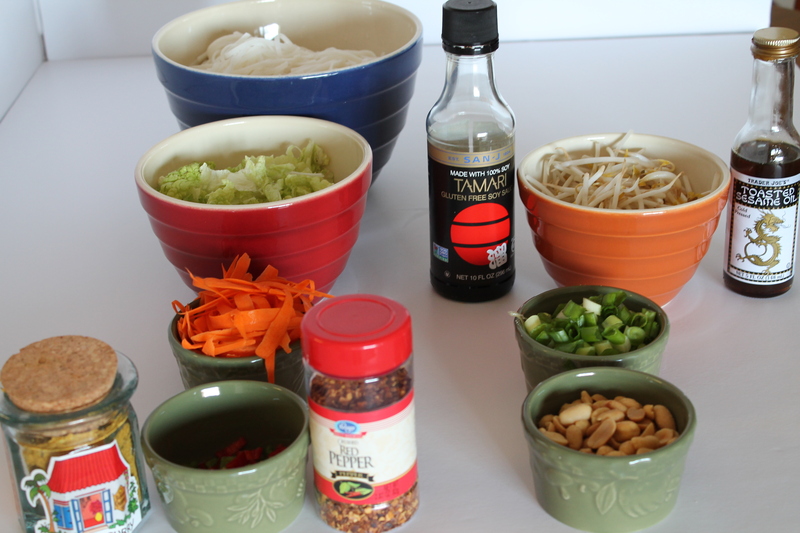 For this dish, the order is: (1) jalapenos; (2) cabbage, carrots, curry powder and red pepper flakes; (3) vermicelli noodles, soy sauce and sesame oil; and (4) peanuts, bean sprouts and green onions. In a large skillet or wok, set the stove top to medium-high heat and add the oil. Separately add each of the 4 sets of above-specified ingredients, allowing each set to cook for about 45 seconds while continuously tossing with a spoon. The dish will be done in less than 5 minutes. It really happens that fast, which is why all of the prep work is essential. To commemorate the occasion, I enjoyed this dish with a cold Irish beer. Our final verdict on this dish was that it tasted above-average, but not awesome. If preparing on your own, one might experiment with adding tofu, chicken, beef or pork. This entry was posted in Around the World Virtual Book Club, Movie Reviews/Book Reviews, Recipes and tagged book reviews, books, cameras, Chinese food, Ireland, memoir, non-fiction, recipes, travel memoirs, vegan recipes. Bookmark the permalink.